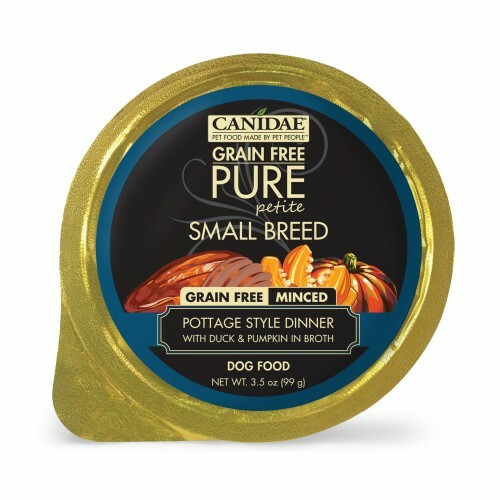 Our CANIDAE® Grain Free PURE Petite® Small Breed Dog Cup Pottage Style Dinner Minced with Duck & Pumpkin wet formula uses simple, limited ingredient recipes for sensitive small dogs. Your pampered pooch will enjoy choosing from a menu of deliciously prepared dishes. And you’ll enjoy indulging your petite companion knowing that each portion is filled with great tasting, premium nutrition. 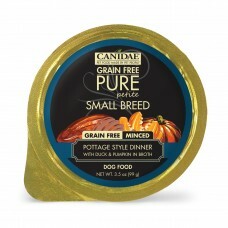 Canidae® Grain Free PURE Petite® Small Breed Pottage Style Dinner with Duck & Pumpkin in Broth Dog Food is formulated to meet the nutritional levels established by the AAFCO Dog Food Nutrient Profiles for growth and maintenance including growth of large size dogs (70 lbs or more as an adult).